Founded just nine years after the incorporation of the City of Beverly Hills, the Church of the Good Shepherd has a long and rich history and holds a prominent place in our city’s ties to the entertainment industry. From its humble beginning in a cozy neighborhood apartment to its current status as a venerable community landmark, the Church of the Good Shepherd has been a fixture in Beverly Hills for more than 90 years. 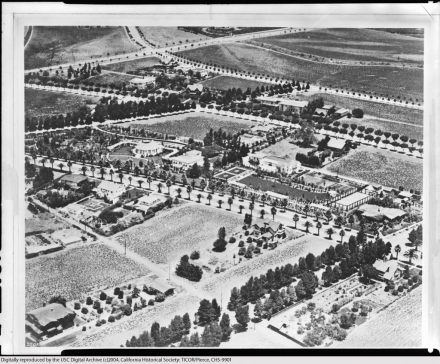 Above: View of Beverly Hills in 1918, from the USC Digital Library. 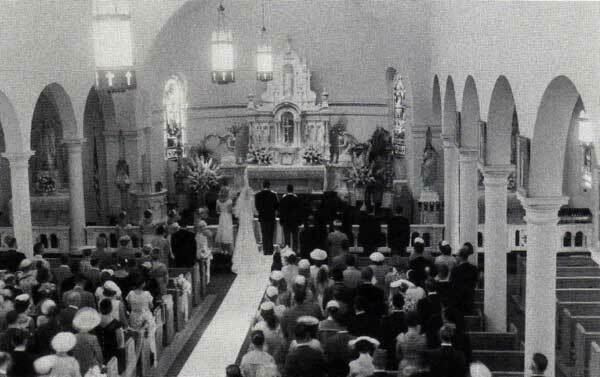 The parish was founded December 12, 1923 in a small nine—year-old suburban community that would, before long, be synonymous world-wide with the rich and famous. In 1923 though, the Church of the Good Shepherd was merely one of 18 parishes founded that year in the newly established Diocese of Los Angeles San Diego; the busiest such year in diocesan history. Bishop John J. Cantwell designated the northwest corner of Santa Monica Boulevard and Bedford Drive as the site of the new church, and assigned Father Michael J. Mullins as pastor. 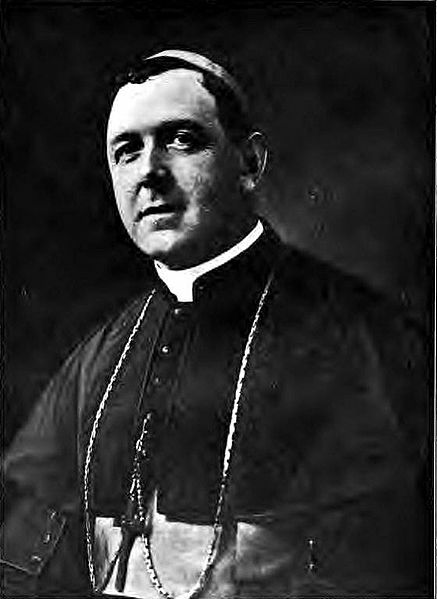 With an eye toward the burgeoning film industry Bishop Cantwell asked Father Mullins to establish the Catholic Motion Picture Guild. The Guild and Good Shepherd Parish itself were soon populated by such film notables as Jackie Coogan, Neil Hamilton and Ben Turpin and in later years would include the likes of Ray Bolger, Jane Wyman, Jimmy Durante, Danny Thomas, Loretta Young, Gene Kelly, Rosalind Russell, Irene Dunne, Ricardo Montalbano, Bob Newhart, Jack Haley and MacDonald Carey. The first Mass of the new parish was celebrated in the Windmere Apartments just south of the current church site. The growing community soon moved its Sunday Mass celebrations to a small rectory on Camden Drive and then to the Beverly Hills Hotel. Meanwhile, throughout 1924, the mission-style parish church and rectory — designed by J.J. Donnellan — were constructed, and on Feb. 1, 1925, Bishop Cantwell presided at the dedication ceremonies of the new frame-and-stucco building. The church was subsequently renovated in 1959, with the addition of a new marble main altar and two side altars. Sealed in each altar were the relics of Ss. Felicitas and Perpetua, and St. Vibiana, patroness of the Los Angeles Archdiocese. On Sept. 8, 1930 the brand new Good Shepherd Parish School at Linden Drive and Charleville Boulevard opened. It remains the only Catholic school in Beverly Hills, and to this day maintains standards set by the sisters so many years ago; Excellence in Faith, Academics and Service ~ Serving students PreK3-8th Grade. 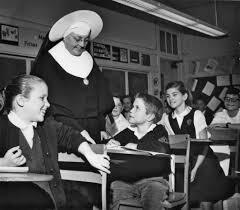 Above: This 1961 picture in the classroom of Sr. Honora and Jon Provost excludes the lovely collie Jon shared the screen with in the TV series. When Father Mullins was re-assigned in November of 1938, Father (later monsignor) Patrick J. Concannon assumed the pastorate of the Church of the Good Shepherd, and ministered faithfully and enthusiastically for nearly 20 years, as the parish grew to more than 1,500 families. His service ended April 29, 1958 when, at the conclusion of Mass, he fell dead of a heart attack at the foot of the altar. In his place came Msgr. Daniel F. Sullivan, who — as a member of the Archdiocesan Building Commission— oversaw the 1959-1960 church renovation. Msgr. Sullivan served as pastor until his retirement in December 1982, the longest tenure of any pastor in parish history. 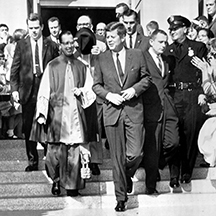 Among the most memorable highlights of that time, he once noted, were the occasions that President John F. Kennedy attended Mass. Msgr. Sullivan was named pastor emeritus after his retirement. He was succeeded as pastor by Msgr. Peter C. Healy, who had been the first director of the Permanent Diaconate in the Archdiocese. Msgr. Healy was in turn succeeded as pastor by Father Colm O’Ryan in Sept. 1991. In July of 2009, Father O'Ryan was named pastor emritus after his retirement, and Msgr. Thomas Welbers became pastor. Father Ed Benioff is our current pastor, succeeding Msgr. Welbers after his retirement in June of 2015. Fr. 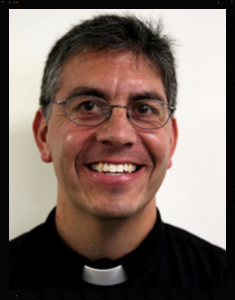 Ed, a Los Angeles native, was appointed by Archbishop Jose Gomez as Good Shepherd's Pastor beginning July 1st, 2015. Passionate about sports as a child, he played football, basketball, tennis and baseball, hoping to go pro and live the life of a famous athlete. He soon found a passion for teaching and followed his parents' footsteps in education while becoming active in his local parish. He became convinced that Jesus was calling him to give his life to the Church and was ordained a priest in 2007. In addition to having served in San Pedro at Holy Trinity and as Chaplain for Bishop Montgomery High School in Torrance, Father Benioff is the Director of New Evangelization for the Archdiocese of Los Angeles. He brings many gifts of leadership, communication and teaching to his ministry here, and we are so blessed for him to join our church and school community!